Rita Elizabeth Schaefer, daughter of Herman and Catherine (Steinbach) Schaefer, was born April 2, 1922, on her parents’ farm in rural Wells County where she was raised with her 11 brothers and sisters. She attended Fairview Country School grades 1 – 8 and then attended New Rockford High School. After high school graduation, she attended Minot Business College and worked in Minot. On January 21, 1943, she married Marvin Riedesel from Cathay, ND. She and Marvin purchased the farm 1 mile west of Cathay in 1944 where they were blessed with 4 children: Marvin Jr, twins, Patrick and Penelope, and Jeffrey. Together they ran the family farm, tended to livestock, and worked in their garden until they retired in 1986. They remained on the farm until Marvin passed away in 1998. Rita always had a freezer full of baked goods that she would pull out for a “snack” at a moment’s notice. She looked forward to hosting family gatherings over the holidays or on other special occasions. Rita was a devout Catholic and was an active member of Saint Elizabeth’s Catholic Church in Sykeston. Rita was also involved in the Royal Neighbors Association and served as a leader of the local 4-H club in Cathay. 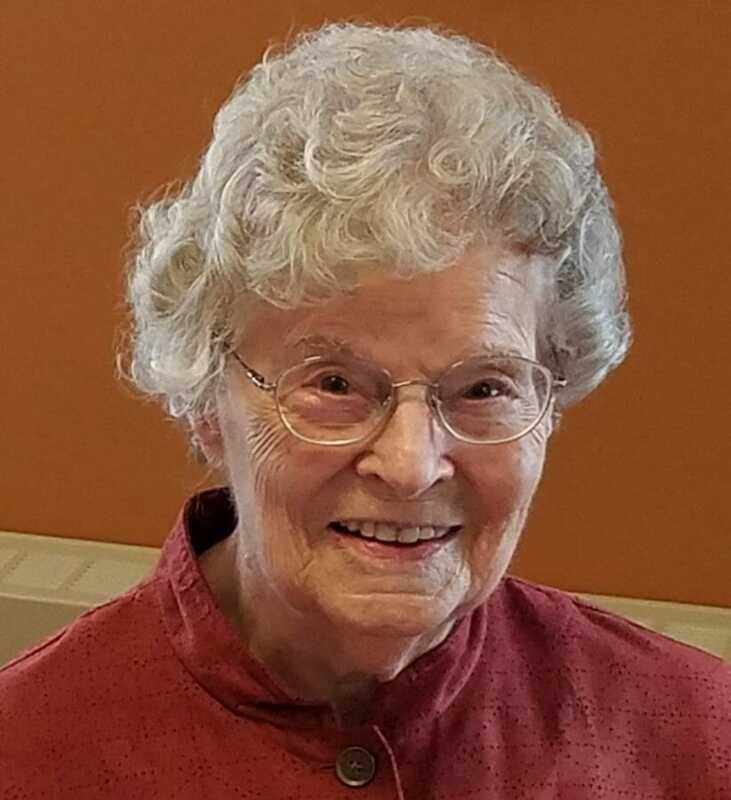 In addition to being an active farm wife, Rita found time for square dancing with Marvin, quilting in neighborhood and church groups, and participating in various card parties held in the community. Both she and Marvin were very family oriented, attending many events for their children, grandchildren and great-grandchildren, locally and in Minnesota and Wisconsin. After Marvin died, Rita moved to Carrington where she lived independently until 2015, when she moved to Golden Acres Estates in Carrington. During her years in Carrington, she was a member of Sacred Heart Catholic Church and graciously volunteered in various church groups and at Golden Acres Manor fixing hair for the residents. She continued to be involved with events for her grandchildren and great-grandchildren. She loved watching professional sports, and had a special interest in the Minnesota Twins. Being able to attend games at Target Field with her son was often one of the highlights of her summer. Although she was retired, trips to the farm during planting and harvest were always special. She liked riding in the combine and at age 94 was still able to enjoy these rides with her grandson, Jadin. In June 2018, Rita moved into Golden Acres Manor where she lived until she passed away on Friday, October 12th, 2018, at the age of 96. She lived a full and rewarding life, a woman of strong faith, who touched many lives with her kindness, grace and positive outlook. She is survived by brother Joseph Schaefer, Fessenden; sister LeNore (Del) Rood, Sturgis, MI; sister-in-law Darlene Daugherty, New Rockford; three children: Marvin (Happy) Jr (Mary) Riedesel, Prior Lake, MN; Penny (Leon) Mindt, Beloit, WI; and Jeff (Kristi) Riedesel, Carrington; daughter-in-law Renee Riedesel, Carrington; and family friend Ellen Geier, South Saint Paul, MN. Thirteen loving grandchildren: Lisa (Dave Atkins) Riedesel, Debbie Riedesel, Kara (Eric Larsson) Riedesel, Curt Johnson, Chris (Kandee) Johnson, Jeff (Mary) Johnson; Ryan (Kara) Riedesel, Erin (Andy) Gray, Shelly (Chris) Clark, Lynette (Brett) Rusert, Tyler Riedesel, Jadin (Katie) Riedesel, Ashlyn Riedesel and 26 great-grandchildren: Andrei, Alexander, Aidan, and Alyssa Atkins; Caitlin Schlussler, Zachary and Benjamin Bangura; Rachael and Rebecca Johnson; Asher Johnson; and Emma Johnson; Lana and William Riedesel; Annika Erickson, AJ, Tempe, and Wayland Gray; Marissa Meyer; Collin, Casper, and Kacy Clark; Claire, Elena, Audra, and Nadia Rusert; and Oliver Riedesel. She is also survived by many nieces and nephews. Rita was preceded in death by her parents Herman and Catherine Schaefer; her brothers Herman Jr, Louis, and James William (Bill) and sisters Helena, Dolores, Kathryn, Josephine, Beverly Annella, and Lois; her husband Marvin, and her son Patrick. Visitation will be held Friday 9:00AM to 5:00PM at Evans Funeral Home and will continue at 6:00PM at church. A Rosary Service will be held at 6:45PM followed by a Vigil Service all at Sacred Heart Catholic Church, Carrington. Mass of Christian Burial will be held Saturday, October 20, 2018, at 10:00AM in Sacred Heart Catholic Church, Carrington, ND. Burial will be held at the Carrington Cemetery. My deepest condolences on the passing of your mom. Aunt Rita, to me, was the definition of graciousness, having first extended me her grace when I was just 2 1/2 years old. I remember that event still and it impressed me forever. She continued to demonstrate that every time I visited with her. I loved her chuckle and her positive attitude. Her love for Uncle Marvin and all of you, and her faith in God, were so heartwarming and inspirational. Aunt Rita blessed everyone whose life she touched. She will be missed, but she is happy now, with her loved, heavenly Father, and her special family members who have passed before her. A very special aunt. Still remember the fantastic meals and all the laughter around the dining room table at the farm. So enjoyed visiting with Rita at Golden Acres..Prayers for all family as you grieve for this wonderful woman. My sympathy and prayers to the family of Rita, a very special lady . I was a friend of Rita’s through our church and we shared a birth year, so we were the same age. I will always remember Rita as such a sweet and kind person and will always have many memories of her. May she enjoy all the joys of Heaven. Jeff: My condolences to you and your family at this time. I remember your Mom as a wonderful lady, loved by many and will be missed by all. May God bless you during this difficult time.